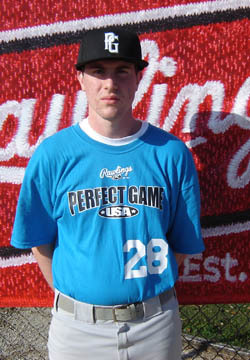 Matthew Wilson is a 2010 C/3B/P with a 6'1'', 182 lb. frame from Creedmoor, NC who attends South Granville HS. Wilson has a lanky body, projectable build, some arm strength, quick transfers, quick feet, good flexibility, some receiving skills, slightly open stance, wide base, longer swing, some bat speed, some pop, 3/4 arm slot, long arm action, high leg kick, quick paced delivery, 11/5 CB, SL better when down in zone, outstanding student.